Ras Umm Sid is located south of Na'ama Bay next to Temple dive site. EI Fanar lighthouse adorns the peak and allows access to the reef from shore - though this involves crossing the reef plate on foot. 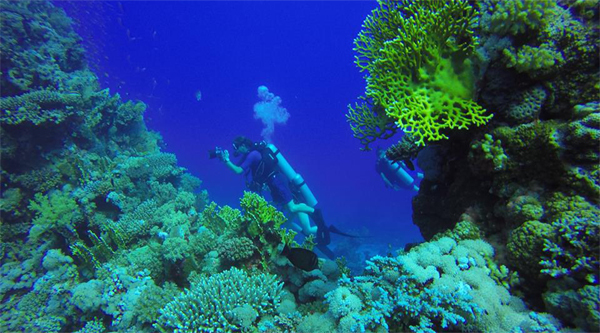 Know more about this unique diving sight. Begin the dive level with the small row of sun loungers under the cliff face, and directly beneath the lighthouse. Maximum depth need to be no more than 20 meters. Keep the reef on the left shoulder, and gain your depth, before slowly ascending to hover over the sea fans at roughly 18 meters. The current generally runs in this direction, and there is a mooring here at 25 meters, consisting of a chain in the sandy bottom. The bay sweeps gently southwards, protected by the headland adorned by a solitary lighthouse. The reef plate protrudes out into the bay, thinly veiled by the turquoise surface shallows, before dropping away abruptly into the main reef wall. Occasional pinnacles are dotted haphazardly, like sheep on a far flung hillside, hanging precariously over the deeper blue and gentle sandy slopes. Scorpion fish nestle under coral outcrops, whilst Lionfish dawdle gently in the current, unhurriedly searching for their next victim. Antheus and Chocolate Dips vie for space, darting in and out of the mild eddies. Jackfish cruise just off the reef wall seemingly oblivious to the various morsels available to them, before accelerating in at blistering speed, causing a veritable orange Mexican wave of escaping potentials. Groupers lazily rest on the sloping bottom, dark smudges against the light sandy grains. Slowly the wall takes over replacing the sandy bottom with its mildly ominous continuance into the depths. A huge Napoleon Wrasse gracefully hovers over the forest of gorgonian fans, dominant by displacement but gentle in nature and attitude. Moray eels peer out of hollows, apparently tasting the current with a sommelier's nose for a good bouquet! 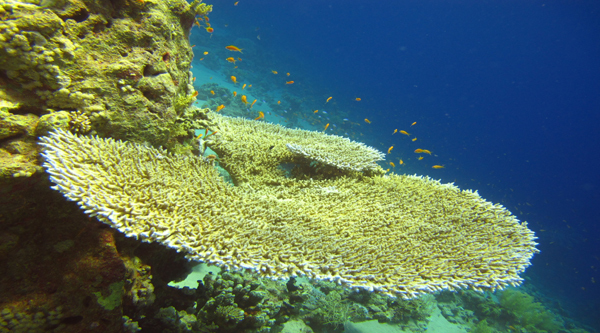 Slowly, the drop off merges with the headland, and coral pinnacles begin to overlap like soldiers on the parade ground. A profusion of colour now greets the eye. Prickly alcyonarian in the brightest hue, positioned next to subtle grass corals. Broccoli corals dip and weave like flowers in the meadow caressed by the breeze. Fire coral innocuously levitates off outcrops and pinnacles alike, hiding its deadly yet miniscule barbs. Table corals of magnitude balance delicately atop the small pinnacles. A large salad coral sits incongruously amongst the outcrops, adorned with small clams, and an occasional prickly pen shell. Crocodile fish press themselves into the sandy patches, immobile and secure in their motionless status, believing themselves invisible. Snapper hang up current aligned with precision, contemplating the raucous hoard beneath them with their haughty gaze. Trigger fish tug at coral exposed after rigorous and furious blasts into the sand, occasionally raising their webbed horn to warn-off a surreptitious observer of impending territorial defense. 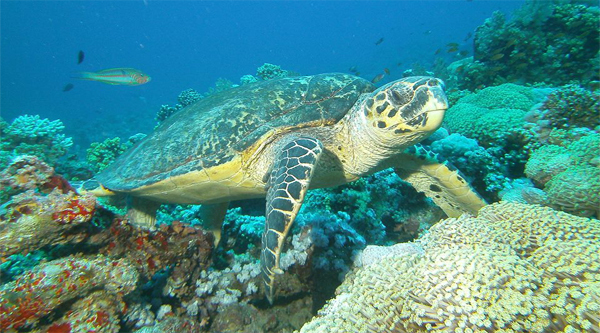 A turtle sweeps and turns fluidly between the soft and hard corals, immune to any current, pausing briefly to sample random fares. Milkfish rush aimlessly after each other in random disarray, quick as the herding dog, yet stupid as the sheep. Off in the blue a lone Manta Ray meanders along its course, sensuously carving the ocean apart, happy in its solitude as an albatross on the breeze. Rays of sun light dapple the contours of the reef, throwing shadows behind outcrops, but streaming unchecked into the blue. As the wall materializes into the headland itself, retain this depth, and as the current increases, allow it to push you off the headland and away from the reef plate. Air is permitting, cruise high over the pinnacles and coral outcrops, before beginning to meander back towards the reef. Ascend gradually, and the headland passes. The reef plate now extends down to 10 meters, or so, and then the bottom gently slopes away. The reef on your left shoulder, proceed along the wall, with the current traditionally with you, until ascending for your safety stop. You surface right around the headland, so a drift, or semi-drift, is advisable. 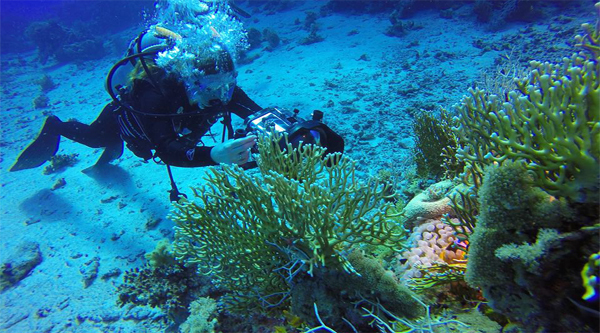 You can reach the sea fans and then turn around before the current picks up, but this will minimize the impact of the largest portion of the dive. 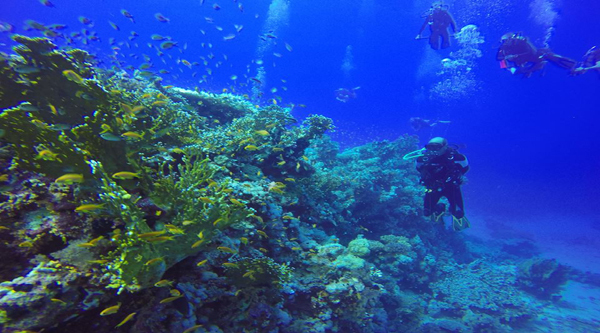 If diving as a first dive, set the maximum depth at 25 meters and make the most of allowing the current to push you far into the blue of the headland before returning to the reef. However 5MB and reel may be appropriate as currents can be strong. Suitable for divers with minimal experience, but appreciated best when drift diving, so consider the option best fitting the group as a whole.